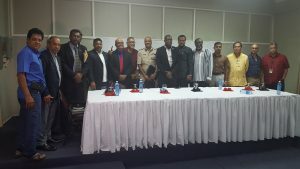 Representatives of the Private Sector Commission and other stakeholders met with Minister of Public Security Khemraj Ramjattan, Police Commissioner Seelall Persaud and Director of Prisons Gladwin Samuels at Georgetown Club, Camp Street. The Private Sector Commission (PSC) Friday night suggested that government should take some responsibility for Guyana’s two major prison riots in 16 months because a good mechanism to gather and analyse intelligence was scrapped by Public Security Minister, Khemraj Ramjattan. Head of the PSC’s Governance and Security sub-committee, Gerry Gouveia levelled the charge as Ramjattan, Police Commissioner, Seelall Persaud and Director of Prisons, Gladwin Samuels were wrapping up a meeting with members of the business community, trade unionists, religious leaders and private security services at the Georgetown Club. “In disbanding that when the minister took office, I think he lost a big opportunity in having information to be used as intelligence to preempt these things from happening,” Gouveia told reporters. “We were in the prisons everyday.We were in the prison talking to prisoners, talking to prison officers. every month , I met with the entire echelons of the prison administration dealing with those issues,” he added. Gouveia said the Sentencing Management Board, which was recently re-activated after it was suspended for more than one year, had between 2010 and 2015 been involved in training prisoners and granting character certificates and skilled certificates, the provision of acceptable food and other conditions. “I believe that the Law and Order Commission was a vital forum, a monthly forum that was chaired by the Minister and I believe that the Minister should re-activate the Law and Order Commission….It was a place where a lot of information was being fed into the system that could then be translated and used as intelligence,” said the former Chairman of the Law and Order Commission. Asked what was the reaction to that call that was issued in the closed-door meeting, he said there was none. Back in March 2016, 17 inmates were burnt to death when prisoners burnt a section of the Camp Street jail. The Guyana Human Rights Association (GHRA) and the Prisons Director have labelled as “miraculous” the fact that no inmate was burnt during the Sunday, July 9, 2017 fire that destroyed the entire Camp Street jail except for one concrete building. The former head of the PSC, Georgetown Chamber of Commerce and Industry and the Tourism and Hospitality Association of Guyana also expressed concern about the low pay and working conditions of prison officers. “The past government and this government are not paying enough attention to the welfare and salary of the prison officers,” he said. Prison Officer Odinga Wickham was shot and killed during Sunday’s fire. Several others are still hospitalised and recuperating from chop and shot wounds.